this is an extended GS400 with the ability to display live engine data. The new generation of automotive code readers that support Controller Area Network(CAN) protocol has arrived. The MaxScan GS500 CAN OBD2 / EOBD auto scanner supports all OBD2 protocols, including the newly released Controller Area Network(CAN) protocol, allowing users to keep up with the latest development in automotive diagnostic scanning. 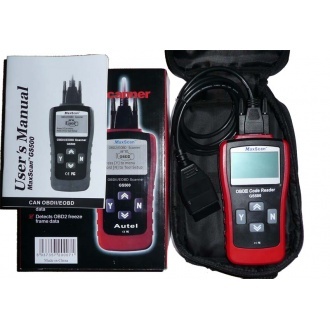 An essential piece of kit for all car and van owners; save time and money with this hand held code reader that enables you to troubleshoot any problems in your vehicle by reading the Diagnostic Trouble Codes (DTC) that appear when the "check engine" light is showing. |DTCs are codes that are stored by the car's in-board computer system (ECU) in response to either a mechanical or electrical vehicle issue. Codes relate to a particular problem and are made up of a 5 digit alpha-numeric sequence and are used as a guide to help locate the fault in order for you to fix the vehicle. If you have got a connector in your car that looks like this: Then the chances are that this code reader will work for you! Additionally, this scanner has CAN Protocol Support which gives wider vehicle coverage. It resets the check engine light, reads and clears all generic, and some manufacturer specific DTCs, displays the I/M readiness status, views OBD II freeze frame data, displays pending codes, retrieves vehicle information (VIN) [on supported vehicles], and determines the status of the malfunction indicator (MIL) lamp. Unlike earlier versions, the GS500 displays the DTC definitions on the backlit and easy-to-read screen. 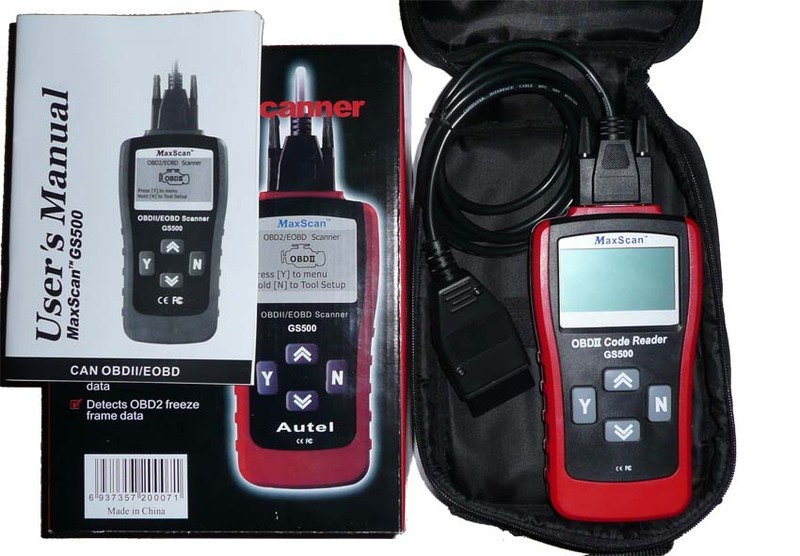 This is the latest MaxScan OBDII scanner and totally out-performs all previous models. Help prevent costly future engine trouble and identify problems when buying or selling a used vehicle with the GS500 scan tool. - Works on any Universal OBD2 or EOBD Vehicle. - Suitable for almost all US cars after 1996 - European cars after 2000. Even though later VAG vehicles are OBD-II compliant, please use the VAG405 VAG Trouble Code Reader or the simpler VAG305. If your petrol passenger vehicle was manufactured for sale in Europe, with the model year of 2001 or newer (and in some cases 2000), you have the EOBD / OBDII interface. EOBD diesel vehicles start with the 2004 model years. Some Asian models such as Subaru were OBD-II before 2000.